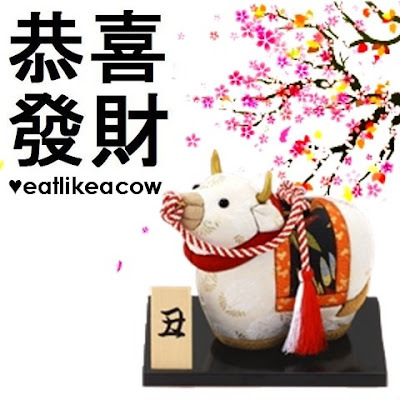 eat like a cow: Happy Chinese New Year 2009! Wagyu. Tokujo karubi. Hokkaido milk. Matsuzaka beef. Wu xiang niu rou. Mongolian beef. Shimofuri sukiyaki. Fillet Mignon. There's so many ways to celebrate the year of the Ox (although I'm unsure if you're supposed to feast on or restrain from beef in the year of the Ox, LOL). In any case, this year is especially meaningful for us since this is OUR year here at eatlikeanox.blogspot.com (...and the corniness continues). And we'd like to share this wonderful, enriching Chinese celebration with you, dear readers - may this year be filled with prosperity, loads of hongbaos (for those to-die-for Marni fur coats, Goyard trunks, and maybe those are-you-f***ing-kidding-me Bottega Veneta cushion bags, if that's your cup of tea), and of course, food glorious food. Gong xi fa cai, kung hei fat choy, keong hee huat chye. Book a table at Hong Kong's Peninsula or Singapore's Fullerton, toss the yusheng and shout something auspicious! Happy year of the cow...er...ox, everyone! You see, (and I'm deadly serious about this), are we supposed to eat lots of beef this year (for good luck) or eat less???? Confusion!